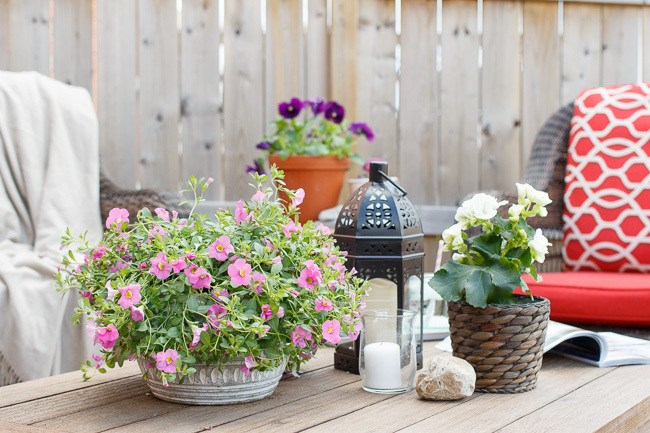 elliven studio: Spring Patio Flowers! Hi everyone! I am super excited to be taking part in a fun Outdoor Extravaganza Hop, hosted by Shauna from Satori Design for Living! 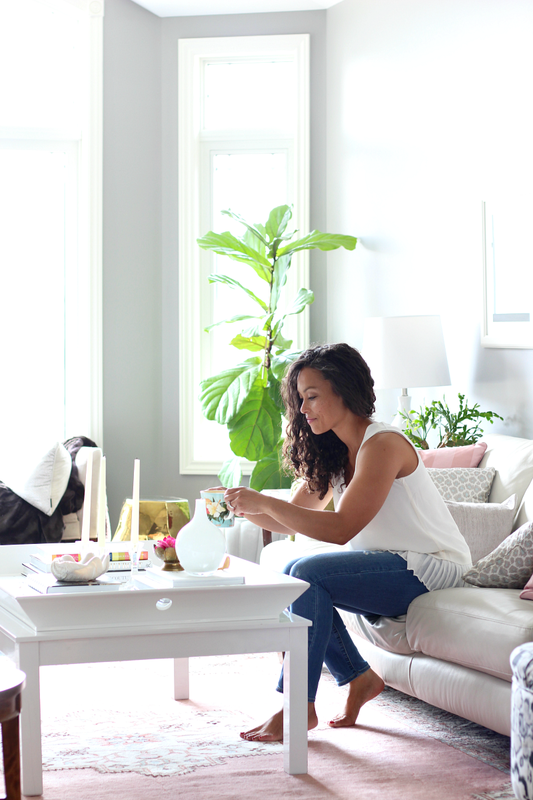 Over the next four weeks, a group of us will be bringing spring decorating inspiration to you! I'm such a huge fan of this time of the year. When the temps slowly begin to creep up high enough so that you can head out back and enjoy the patio. 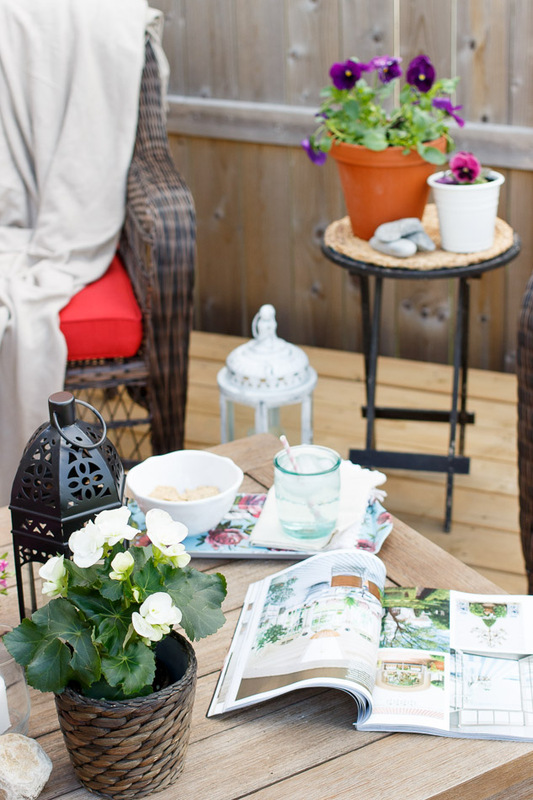 Last year, we built a lower patio and it's my absolute favourite place to sit during the warmer months. Because of where we live, there's still a chance of frost overnight, so it's really important to choose plants and flowers that are hardy enough to withstand the subzero temps (or you can bring them indoors or cover them). 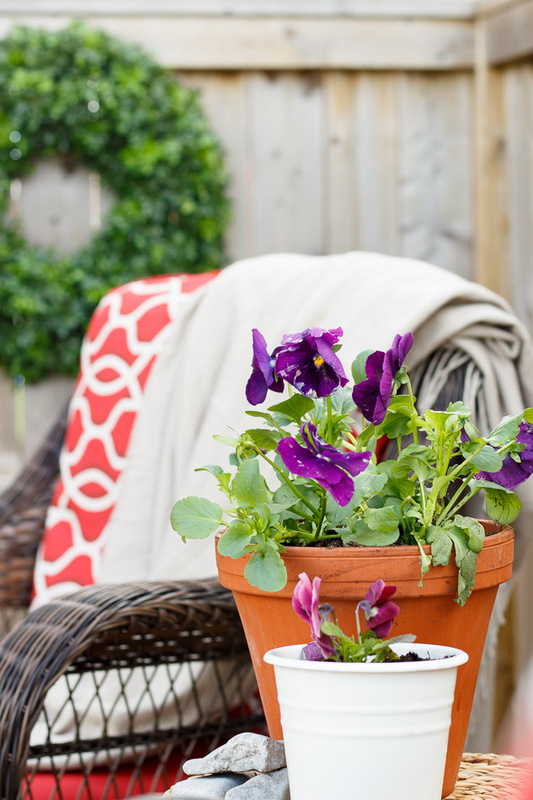 Pansies are hardy plants and may very well be able to handle cooler temps. 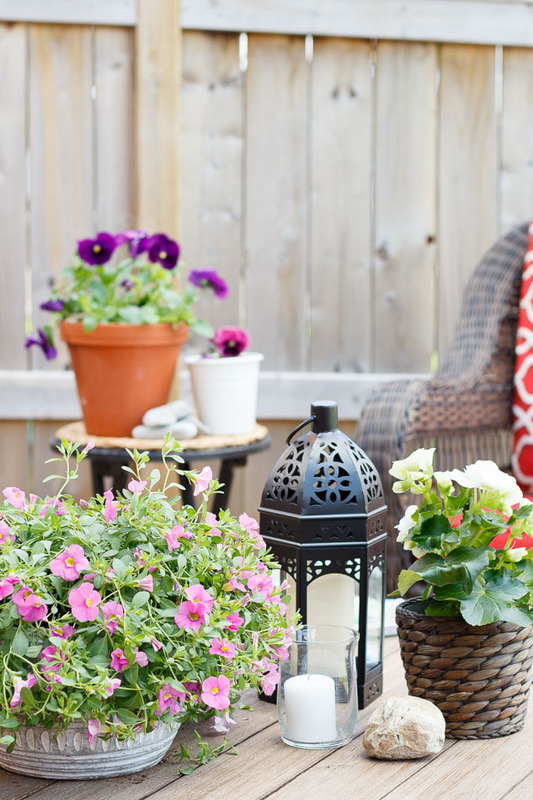 I love nothing more than planters that are overflowing with gorgeous flowers. For that reason, I buy hanging planters for my pots. 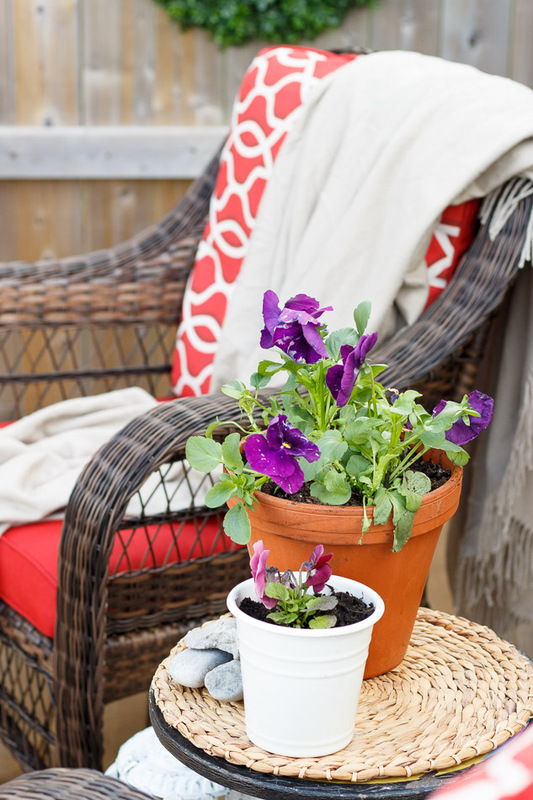 I remove the hanger from the bottom of the basket (they are typically clipped in) and then gently remove the plant from the basket and transfer it to one of my pots (add extra soil as needed). If you're impatient like me, this is a great and inexpensive way to enjoy a full planter at the beginning of the season. For smaller pots, I go with single plants and group a few together. 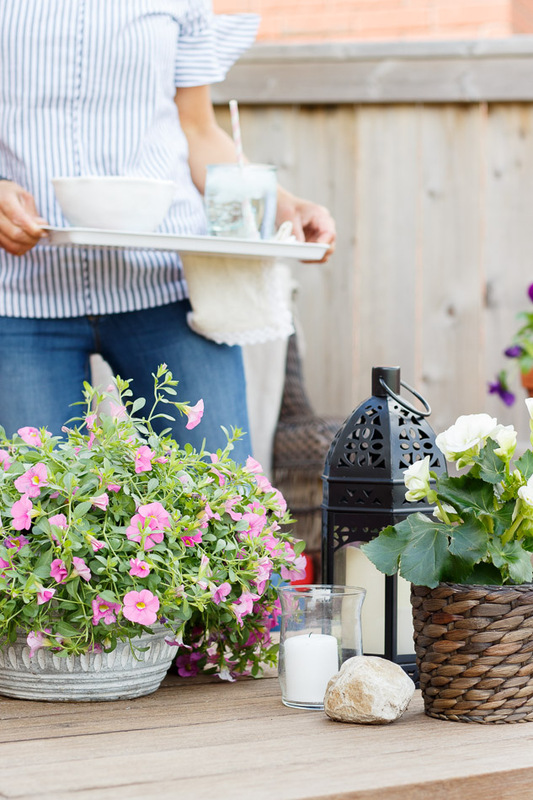 When it comes to styling the plants, a variety of planters at different heights does the trick. 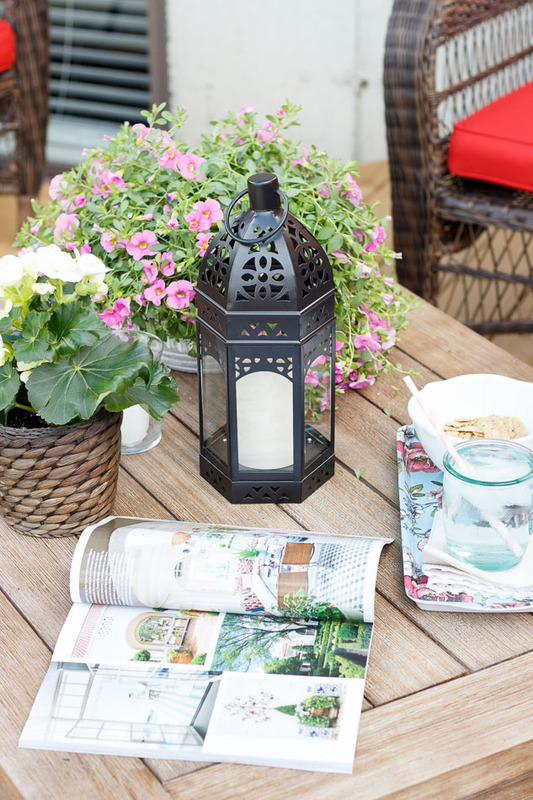 Scatter them around your deck in groupings and don't be afraid to use some driftwood and stones to add some fun texture! 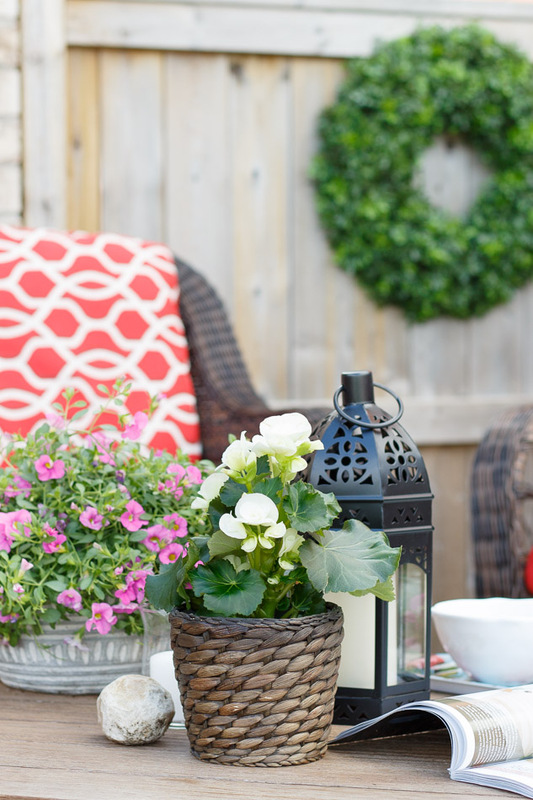 A faux boxwood wreath is the perfect backdrop to this new deck space! Here's how the space is looking with the addition of a few plants! Once the temps rise a bit more, I'll add a few planters to fill up the empty spaces! I gurantee that we'll be back here a whole lot this summer! 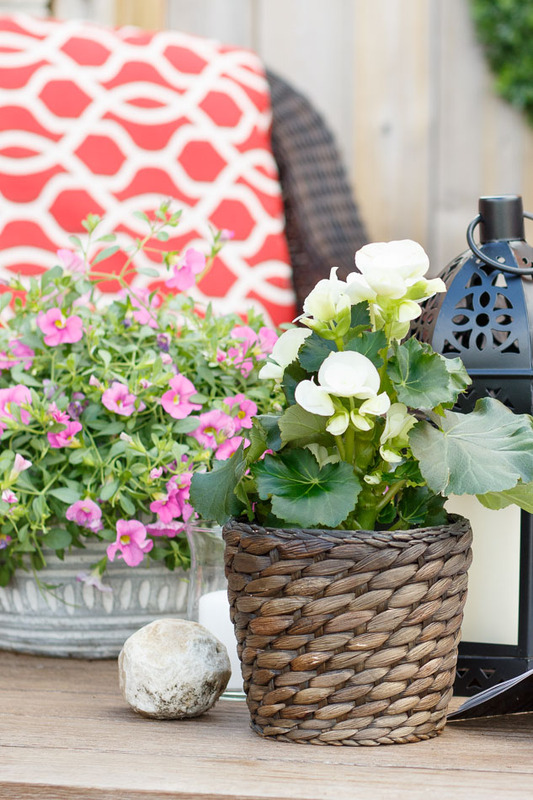 I love the way that flowers cozy up and of course, brighten up the patio. 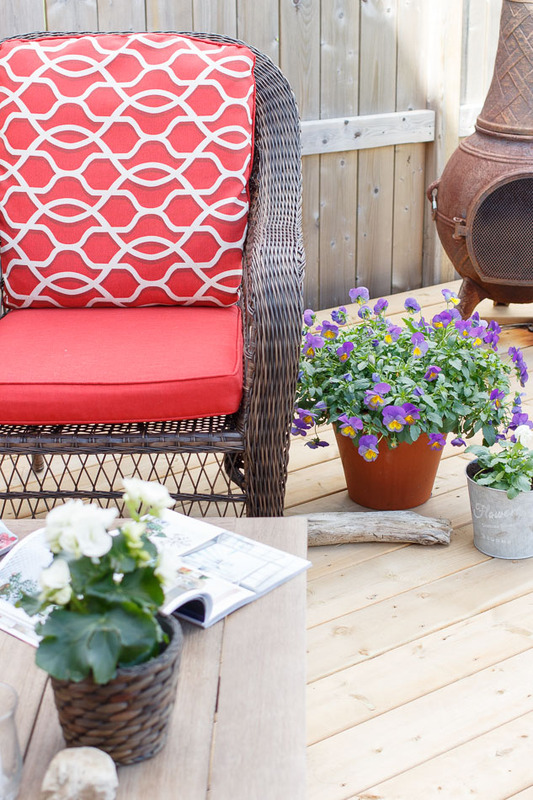 There's nothing better than being surrounded by terra cotta pots full of your favourite flowers! 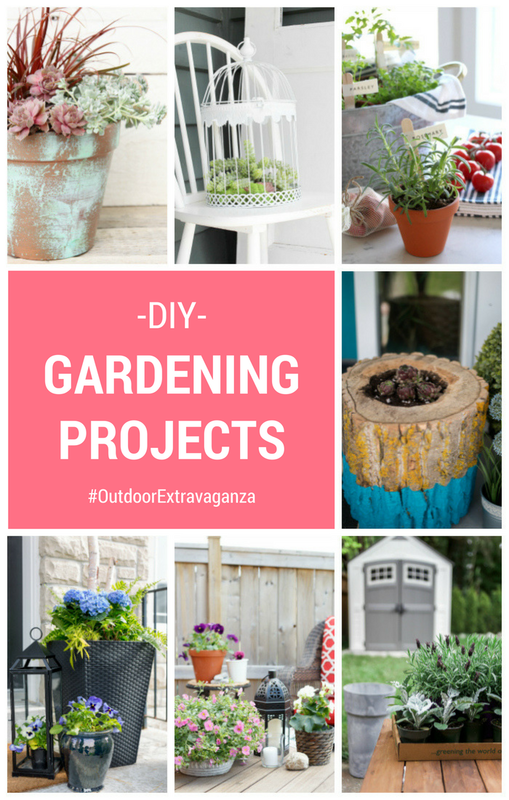 Now it's time to check out the other participants beautiful posts, all of the links are below! Be sure to check back next week for more inspiration! There will also be a link part on May 26th! LOVE those gorgeous pops of colour! So beautiful, Julie! 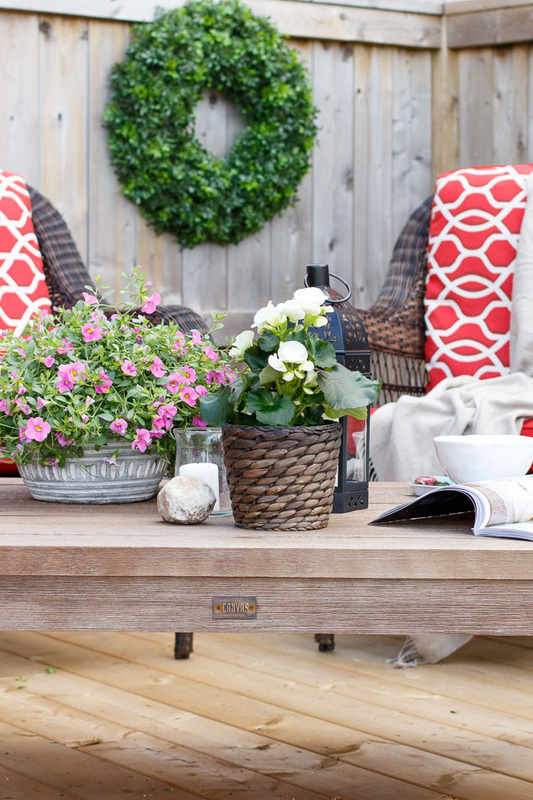 The flowers are the perfect finishing touch to such a fantastic outdoor space! 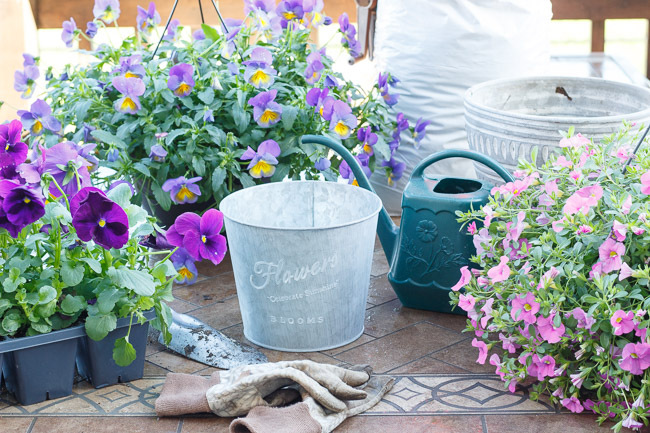 I love that trick of using hanging baskets to fill pots- they look so perfect and full, already! I can't wait for the rain the stop so we can get our outdoor areas set up.... and it will be nice to see the sun again. Enjoy it! 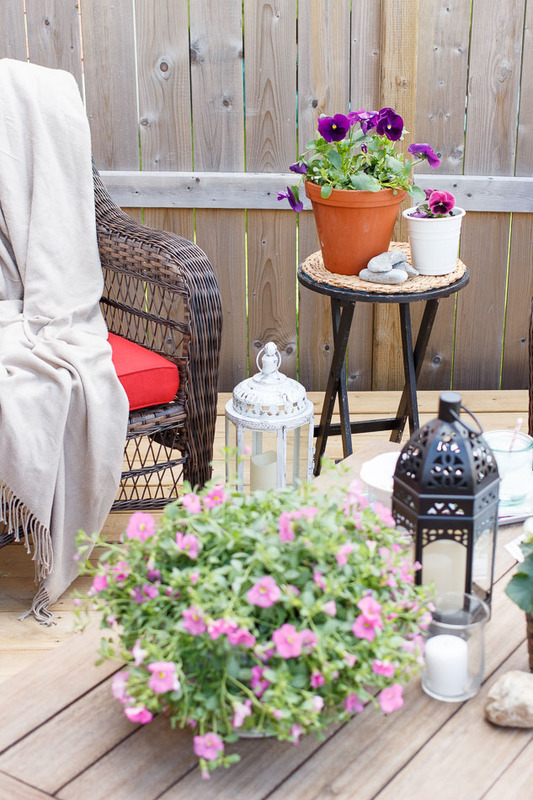 Such a pretty backyard space! I love all the flowers pots. 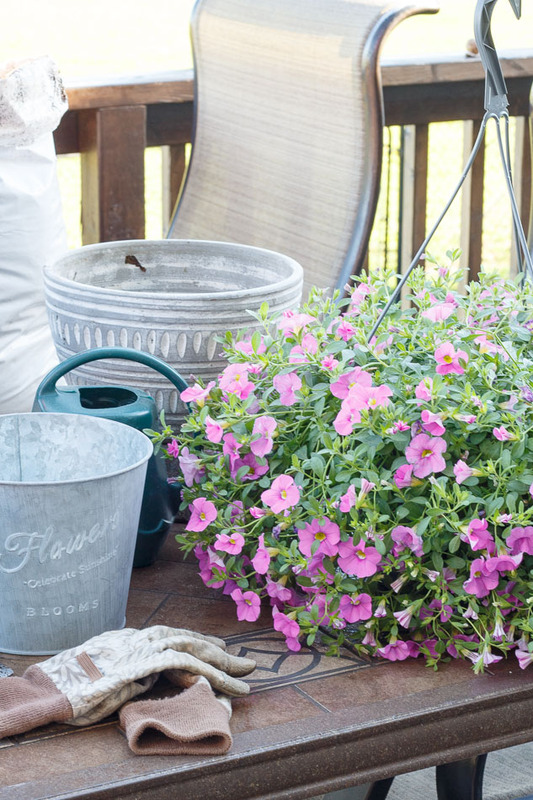 Your deck is looking GORGEOUS, and I love the idea of transferring a hanging basket to a pot. Beautiful!